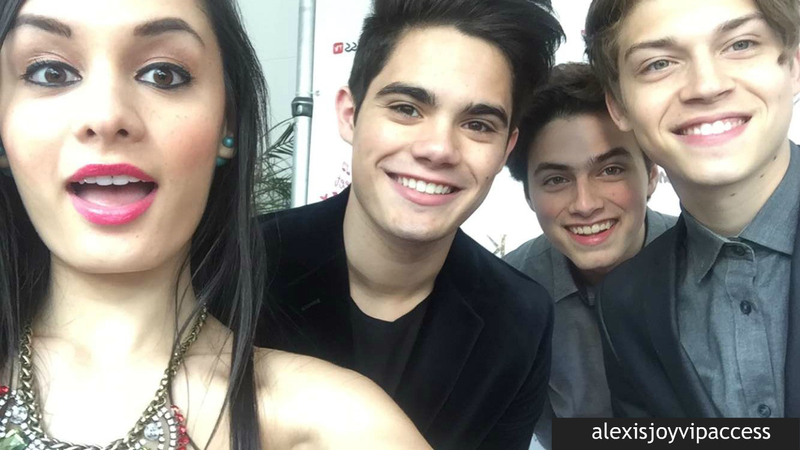 VIPAccessEXCLUSIVE: Forever In Your Mind Updated Interview With Alexisjoyvipaccess At Jordyn Jones’ Sweet Sixteen! Do you know of someone who is forever in your mind? Well, we can think of three! Ricky Garcia, Liam Attridge and Emery Kelly together make up the band that continues to make everyone’s hearts beat a whole lot faster. The incredible Forever In Your Mind endlessly brings out so many remarkable projects that we all can never get enough of. From their recent High School Musical mashup to bringing out a phenomenal and highly-anticipated single in April as well as an upcoming EP. Forever In Your Mind always brings an indescribable amount of excitement to fans with everything they’re working on and they always manage to do such a sensational job with everything. Fans will continue to swoon as Forever In Your Mind has a lot more in store for their fans to stay tuned for! I, Alexisjoyvipaccess had the greatest time catching up with and interviewing again the outstanding Forever In Your Mind at Jordyn Jones’ Sweet Sixteen! Forever In Your Mind dished exclusively to Alexisjoyvipaccess all about their upcoming projects they are working on, the one word they would use to describe their new single, and so much more only in our VIPAccessEXCLUSIVE updated interview. Forever In Your Mind even took on a fun speed round where they spilled on their favorite app, their favorite emoji and more – hear what they had to say in our VIPAccessEXCLUSIVE updated interview below! Thanks for another fun interview, Ricky, Emery and Liam – always a blast chatting with you all! Check out my VIPAccessEXCLUSIVE interview with the exceptional Forever In Your Mind at Jordyn Jones’ Sweet Sixteen below! Previous VIPAccessEXCLUSIVE: New District Interview With Alexisjoyvipaccess At Jordyn Jones’ Sweet Sixteen! Next VIPAccessEXCLUSIVE: The Radiant Izabella Alvarez Had A Blast Celebrating Her 12th Birthday In An Amazing Way! See Pics Here!